Welcome to the ATC Furniture Outlet! ATC Furniture offers special prices on certain items in our Outlet Store. Many of these are regular merchandise but due to an overstock or error in purchasing, we find too many in stock. Others may be discontinued items, prototypes, or even some that might have some slight blemish; if so, each of these will be clearly noted. Also at the end of each year we have a year-end clearance, where we discount many of our most popular items to their lowest prices ever, in an effort to clear out inventory for new product! The clearance items are sold on the outlet as well; get these products while you can, as they will move very quickly! Aruba II features an upgraded two ply-flat polyethylene “Win-Tech” material; the chairs offered on our outlet are in Cappuccino, as pictured above. Aruba II SC (Cappuccino) Closeout Price $68 - sold out! Aruba I is an entry level chair with a sturdy 1.8 mil tubing aluminum frame finished in pepper color powder coat and woven with a single-ply round polyethylene “Win-Tech” material in New Natural color weaving. Aruba I AC (New Natural) Closeout Price $68 - 97 pcs. Aruba I SC (New Natural) Closeout Price $68 - 97 pcs. Aruba I BS (New Natural) Closeout Price $86 - 30 pcs. Domenica brings Euro style to all-weather furniture. Available in stackable barstools, side and arm chairs, with a polyvinylchloride (PVC) shell and anodized, molded-in aluminum legs, it is as durable as it is good looking and made of 100% recyclable products. Domenica AC (Black) Closeout Price $52 - 86 pcs. Domenica AC (White) Closeout Price $52 - 46 pcs. Domenica AC (Orange) Closeout Price $52 - 64 pcs. Domenica AC (Green) Closeout Price $52 - 84 pcs. Domenica SC (Red) Closeout Price $49 - 34 pcs. Domenica SC (White) Closeout Price $49 - 53 pcs. Domenica BS (Black) Closeout Price $69 - 53 pcs. Domenica BS (Orange) Closeout Price $69 - 14 pcs. Domenica BS (Green) Closeout Price $69 - 37 pcs. Domenica BS (Red) Closeout Price $69 - 56 pcs. Edina II is a colorful, playful design reminiscent of bentwood and interpreted in reinforced aluminum tubing with UV resistant polyethylene weaving. Jamaica is a high quality entry-level seating family featuring 1.8 mil anodized aluminum tubing with wide slats. Unlike competitors, wide full aluminum slats provide comfort and durability. Jamaica frames are bent, then polished and finally anodized to retain their shiny good looks. All fastenings are stainless steel. Side chairs and arm chairs are stackable. 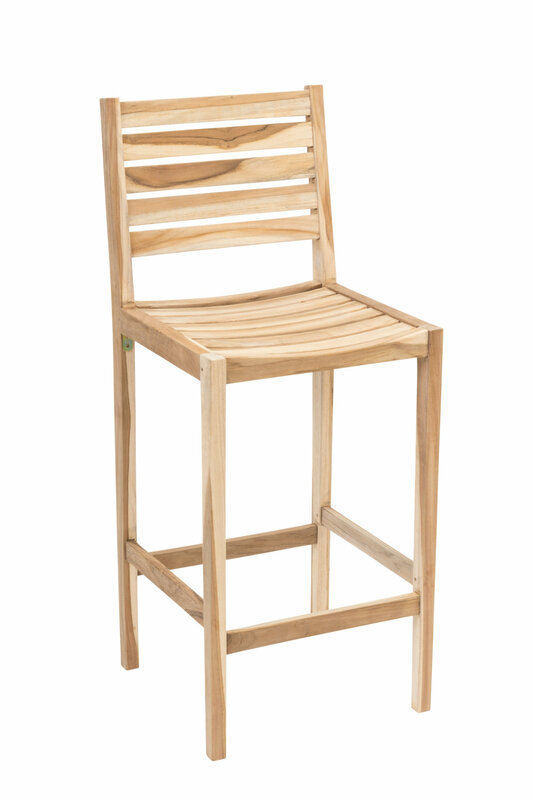 The Reno chair is part of our genuine plantation-grown commercial-grade teak seating line. Both the side and arm chair stack. The Reno is fabricated then weathered and sanded again to remain smooth in use; as they are natural, unfinished items, they will weather to a silver grey unless oiled or finished. Jardin is a steel foldable chair that is available in three classic colors on our outlet: green, blue, and red. Ibiza is a stackable, glass fiber reinforced resin chair that comes in a side chair, arm chair, and bar stool version. Martinique is a stackable, glass fiber reinforced resin chair available in side chair and arm chair versions in several colors on our outlet. Napoleon is a stackable, glass fiber reinforced resin chair in the style of popular wedding banquet chairs. 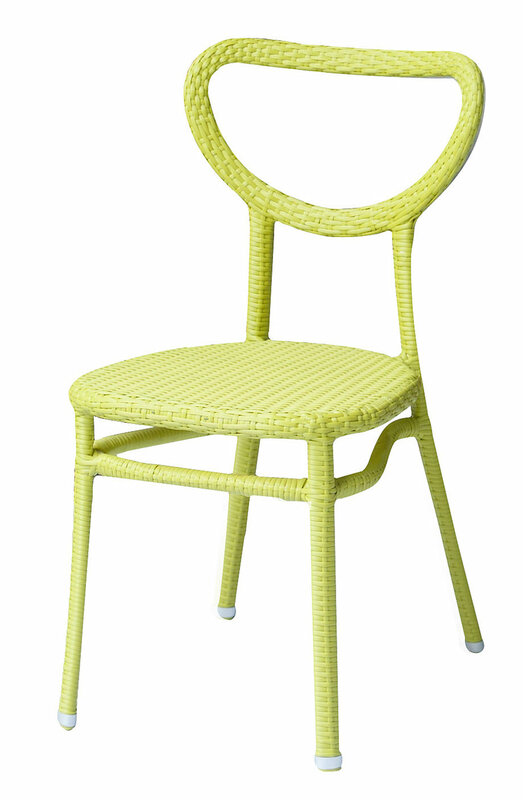 Parisienne features a classic styled, durable aluminum frame powder coated to imitate rattan/bamboo in a realistic way. Upholstered with woven polyethylene, Parisienne will remain comfortable in any weather. The all-aluminum frame provides added strength and comfort, and the unique design assures no metal-to-metal contact when stacking; even the barstools stack up to 4 high. South Beach is a full featured entry-level aluminum furniture family. South Beach features welded anodized aluminum frames with colorful PVC seats and backs at very affordable prices. The chairs stack well. These side chairs are available on our outlet in Grey, Red, Green, and Black. Soho is a white resin side chair. Vegas is a teak chair offered in a side chair, arm chair, and a sturdily-braced bar stool for your convenience. Werzalit tabletops are seamless, weather-resistant molded laminate table tops, proven in extreme conditions around the world. Marble Onyx #052 - 28” x 28” Closeout Price $42 - 3 pcs. Marble Onyx #052 - 36” x 36” Closeout Price $70 - 6 pcs. New Mahogany #303 - 24” round Closeout Price $24 - 2 pcs. New Mahogany #303 - 28” round Closeout Price $30 - 27 pcs. New Mahogany #303 - 36” round Closeout Price $41 - 9 pcs. New Mahogany #303 - 24” x 24” Closeout Price $33 - 12 pcs. New Mahogany #303 - 28” x 28” Closeout Price $42 - 5 pcs. New Mahogany #303 - 24” x 32” Closeout Price $36 - 5 pcs. Sea Grass #105 - 32” x 48” Closeout Price $71 - 17 pcs. Bordeaux #111 - 42” round Closeout Price $70 - 12 pcs. Black Granite #120 - 24” round Closeout Price $24 - 2 pcs. Black Granite #120 - 28” round Closeout Price $29 - 7 pcs. Black Granite #120 - 32” round Closeout Price $31 - 18 pcs. Black Granite #120 - 36” round Closeout Price $41- 24 pcs. Black Granite #120 - 42” round Closeout Price $70 - 1 pcs. Black Granite #120 - 48” round Closeout Price $85 - 5 pcs. Black Granite #120 - 24” x 24” Closeout Price $33 - 18 pcs. Black Granite #120 - 32” x 32” Closeout Price $51 - 12 pcs. Black Granite #120 - 36” x 36” Closeout Price $70 - 3 pcs. Black Granite #120 - 24” x 32” Closeout Price $36 - 7 pcs. Black Granite #120 - 28” x 44” Closeout Price $57 - 9 pcs. Black Granite #120 - 32” x 48” Closeout Price $71 - 14 pcs.